Here is Sime Information about Lakshmi Narayan Temple in Chamba Himachal Pradesh india. Dedicated to: Shiva or Vishnu. Temple Timing: 6 am to 12.30 pm and 2.30 to 8.30 pm. 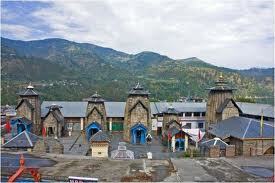 Lakshmi Narayana Temple, which is the main temple of Chamba town was built by Sahil Varman in the 10th century AD. The temple has been built in the Shikhara style. The temple consists of Bimana i.e. Shikhara and GarbhGriha with a small antralya. Laxmi Narayana Temple has a mandapa like structure also. The wooden Chhattries, the shell roof, atop the temple were in response to the local climatic conditions as a protection against snowfall. 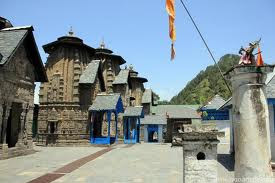 Laxmi Narayan Temple is the most famous temple of Chamba. It is both an architectural marvel as well as a place of great historical significance. Built by Raja Sahil Varman in the Shikhara style, it was first erected in the 10th Century. Wooden Chhatris or umbrella-like structures are built to keep the snowfall off the roofs. There is also a wheel shaped roof that staves off the cold. Every following ruler of Chamba added to the temple. A Radha-Krishnan temple was built by Rani Sarda, the wife of Raja Jit Singh in 1825. A Shiva Temple in the temple complex was built by Sahil Varman and the Gauri-Shankar Temple is said to have been made by his son Yugkar Varman. A Garuda (the mythical eagle) statue in metal watches over the main gate, placed there by Raja Balabhadra Verma. The latest addition to the temple in historic times was in answer to Mughal threat. Apparently Aurangzeb the Emperor ordered that the temple be demolished and Raja Chhatra Singh, to prove that he wasnt afraid, added gilded pinnacles to the temple in 1678. There were also some shrines built in the temple complex. 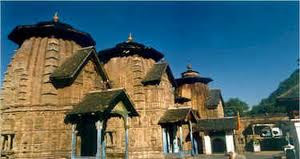 All of which you will see when you visit this most revered temple in what is known as Himachals Holy Valley. The Lakshmi Narayan Temple complex is opened first between 6 am to 12.30 pm and then from 2.30 to 8.30 pm. The 'garbhagriha' or the innermost shrine houses a mandapa (altar) that is prohibited to the public. It also has idols of several other deities. The entire complex consists of six temples in a row from the north to south direction. They are mostly dedicated to Lord Shiva or Vishnu. The other important ones here are of the Gauri Shankar Temple, Shiva Temple of Chandergupta and temple of Radha and Lord Krishna. Divine symbols and images of deities adorn the outer walls of these temples. The shell roofs or the umbrella like structures made of wood was built keeping in mind the climate of the place. Snowfall is inevitable in this part of the state. Legend states that the image of Lord Vishnu present in this temple was made of a rare marble imported from Vindhyachal Mountains. The erstwhile king of the region, Sahil Verma, who constructed this temple, sacrificed eight of his sons to get the marble. And finally, his eldest son, Yugkara succeeded to fetch the marble. He was also attacked by the robbers, but with the help of a saint he managed to save himself. Thus with great effort, the idol of the Lord could be made which is the most revered one here. Lakshmi Narayan temples is situated in the main market. You can reach this place by bus or taxi. So when you reached in the Chamba district then it is 200 meter from the bus stand. Its distance from various places is mainly in km are given which is approximated but not exact. From Kangra it is mainly 100 km, from Hamirpur it is 210 km, from Shimla it is nearly 350 km and from Mandi it is about 295 km.